Her hair is very short and tapered in the back and kept longer on front for extra versatility and edgy look. This type of style is quite suitable for fine and normal hair types. Girls with heart and diamond face shapes can enjoy this haircut and it is easy to style. 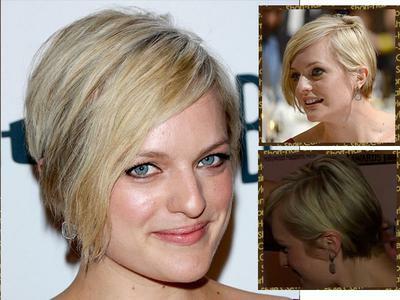 Elisabeth Moss told accesshollywood.com that she like to cut her hair short and that is something she like to do during off time in order to feel and look different.